Hi everyone! We just wanted to let everyone know that we surpassed our goal of $300 for Share Our Strength’s Great American Bake Sale to raise money for their No Kid Hungry campaign! We raised $340 dollars which was added to our team leader, La Casa de Sweets’, goal of $1,000. We committed ourselves to raise money and awareness throughout the month of April for this great cause and could not be more thankful to everyone who purchased sweets, donated money, and showed their support. Thank you! I’ve never really participated in a bake sale before. I’m sure that’s hard to believe since I’m such a sweets lover. My participation is limited to purchasing bake sale items for my own enjoyment. I have no idea about what the “rules” are. But when we Crusaders decided to host our own bake sale to raise money for Share Our Strength’s Great American Bake Sale, I thought, “How hard can it be?” Then I happened to watch the movie I Don’t Know How She Does It. Sarah Jessica Parker’s character has to take something to her daughter’s school bake sale and, for fear of looking like a failure to the highly domestic moms, she doctors up (or destroys, depending on how you look at it) a store bought pie, hoping to pass it off as homemade. This put fear in me. Do bake sale items HAVE to be homemade? And if so, what qualifies as homemade? Does it have to be from scratch? And what if it turns into a TOTAL disaster?! Deciding that as a stay at home mom I should have the time to do a recipe from scratch, I searched the internet for the perfect bake sale cupcakes. Stacy would be doing chocolate, so I wanted to something that would be more of an opposite, but still fun and seasonal. 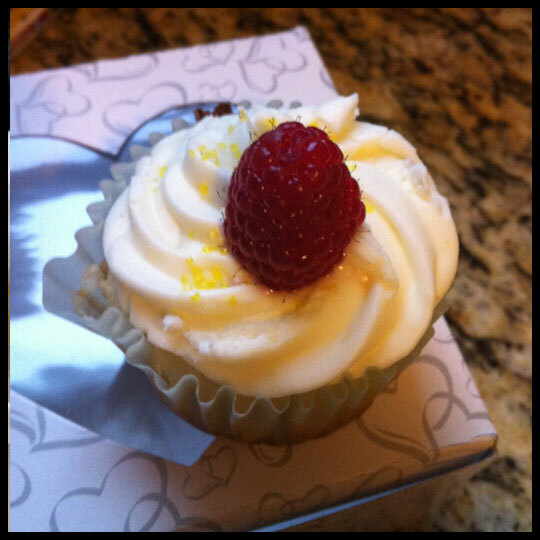 With these thoughts in mind, I came up with Lemon Raspberry cupcakes with a raspberry filling and a lemon cream cheese frosting. The problem with being a new baker and at the mercy of the internet for recipes is that if you haven’t tried it, you don’t really know if it’s going to be good. 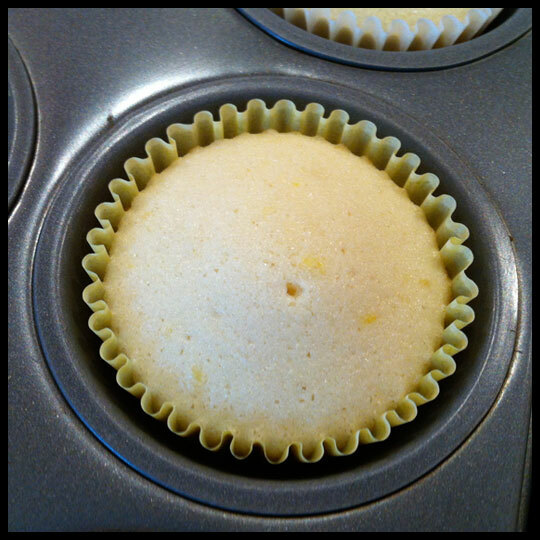 So, when I found LemonCupcakes.net, claiming that the recipe on The Little Red House blog was the best, I decided to trust them. The recipe is for Lemon Coconut, but the cake is purely lemon. 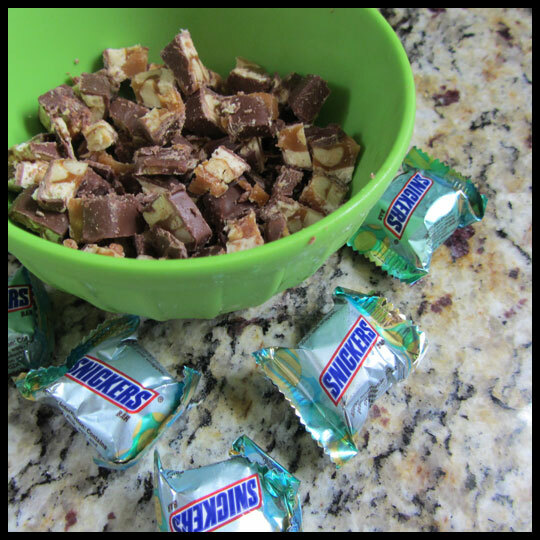 As soon as I saw that the recipe included using more than one bowl, I panicked. Anything using more than one bowl for a cake is bound to be complicated and I only had 40 minutes, if I was lucky! My goal was to get the cake batter done and in the oven before my daughter woke up from her morning nap. Well, that didn’t happen. At some point during my process of measuring dry ingredients and whisking the eggs and buttermilk, Leah woke up from her nap, only adding to my level of stress. How was I going to finish this complicated recipe (okay, complicated for ME) with a curious, mobile, and awake 9 month old? I prepped an area in the family room next to me, removing the dog’s water bowl, so that Leah could freely, and safely, roam around while I finished up the batter and kept an eye on her. Of course this would be the day that she learned how to turn the tv on and off…but the batter was much more important than the tv at this point! 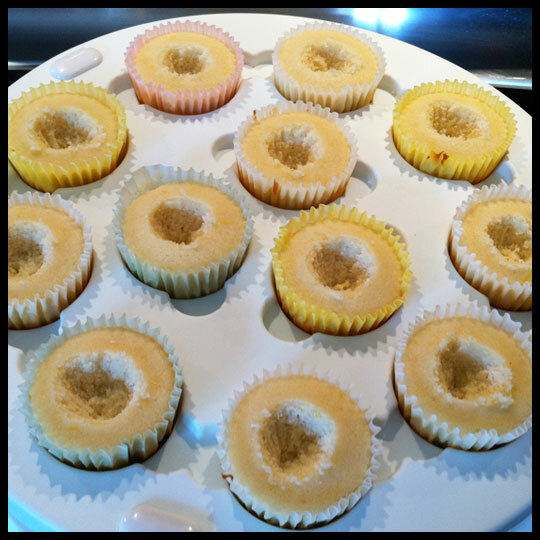 I cut out a part of the cupcake center, since I’d be filling them later anyway, to taste it. The cake was dense, but so moist! Relief set in. Only two more items left to make! 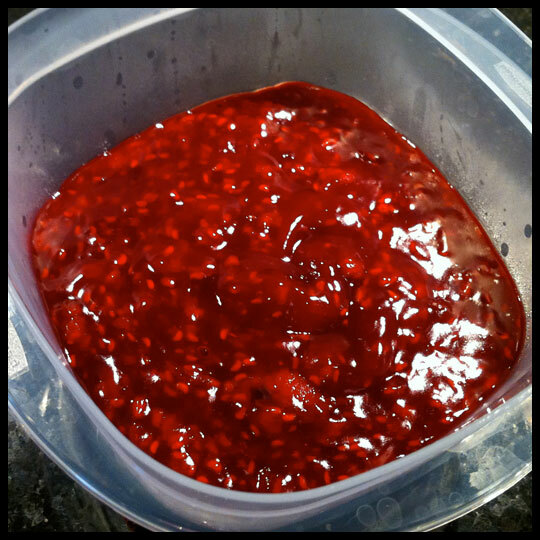 I found a recipe for raspberry cake filling on Food.com. It looked so simple and it was! I think it also helped that I waited until the next day, when someone else was home to keep an eye on Leah, so that I could put all my focus on making the perfect filling. 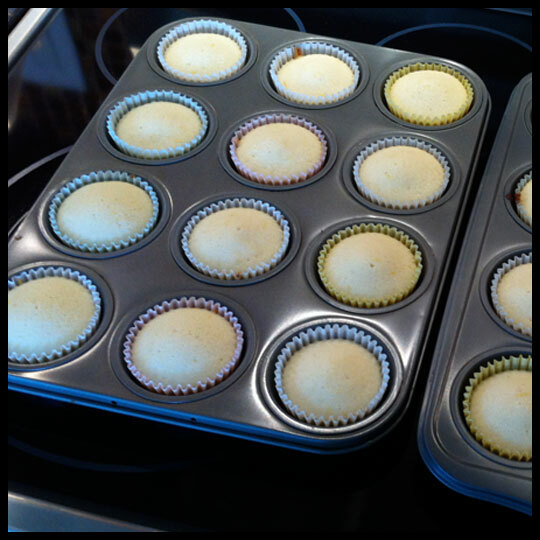 Just as I’ve done before, I cut out the centers of the cupcakes so they’d be ready to spoon in the filling. One day I’ll experiment with my filling injector, but now was not the time to risk failure, especially after making it this far. 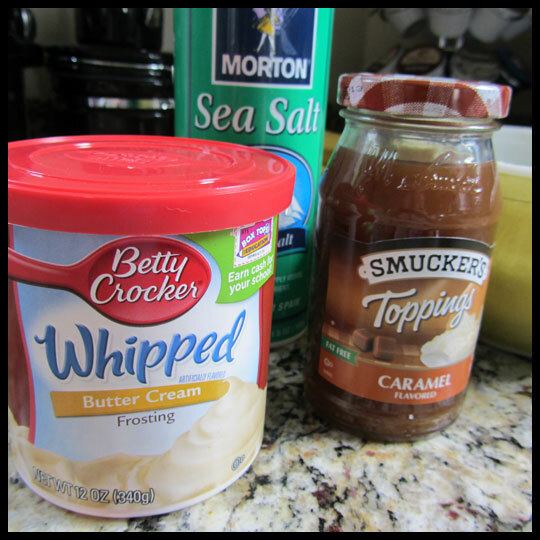 When it came time for the frosting, I decided not to go with the option on The Red House’s recipe. I was worried that it wouldn’t be lemony enough. 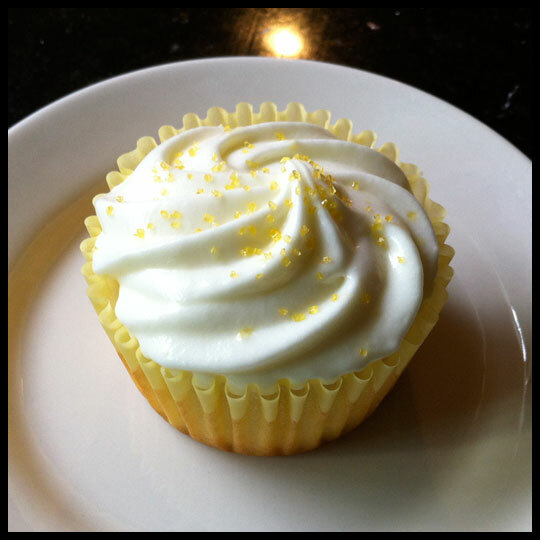 Instead I used a recipe from Annie’s Eats for their Blueberry Lemon cupcakes, which uses lemon juice and zest. After using the 3 cups of sugar the recipe calls for, I thought the frosting was the consistency that I wanted. However, when I got around to piping, it was very runny. So, I dumped the frosting out of my stainless steel piper and added another 1-2 cups of confectioners’ sugar. That seemed to help a little, but it still wasn’t the exact consistency I wanted. I went with it anyway, knowing that since it was warm in the house getting the consistency just right would be difficult and that the frosting would set up better as soon as I moved them to a cooler location. 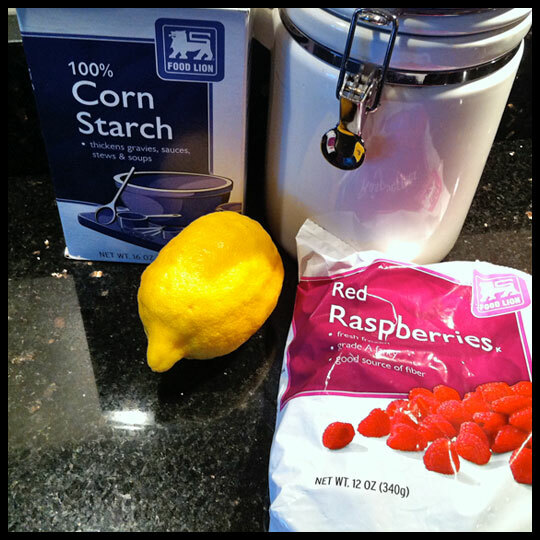 The lemon and raspberry came together in a perfect balance. I was worried that the filling wouldn’t bring enough raspberry flavor, but it was perfect. 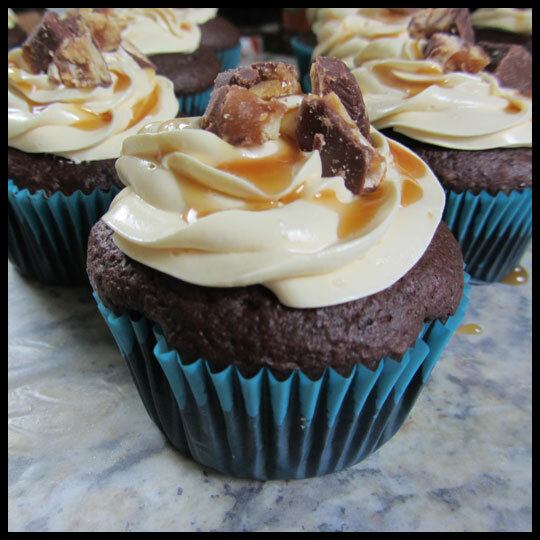 Despite all the hard work, I will definitely make these again! They were a huge hit at the bake sale and that’s what really matters! Sometimes I have moments when I realize how lucky I am to have my friends in my life. I mean, I always know that I’m fortunate, but every once in a while something happens and I think to myself, “What would I do without these fabulous ladies?” Well, last Friday night was one of those moments. My friend, Kerry, and I hadn’t seen each other in quite a while, so I invited her to my house to do a little baking for Share our Strength’s Great American Bake Sale. 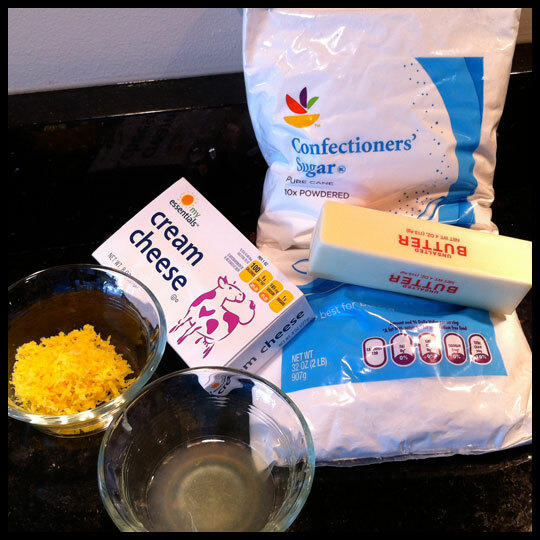 The task at hand would be a first ever attempt at cake pops. Neither of us had made them before, but I thought I owned everything I needed to make it a painless process. Even with the help of my BabyCakes cake pop maker and cake pop mix, we still encountered many problems. At first, things started out smoothly. 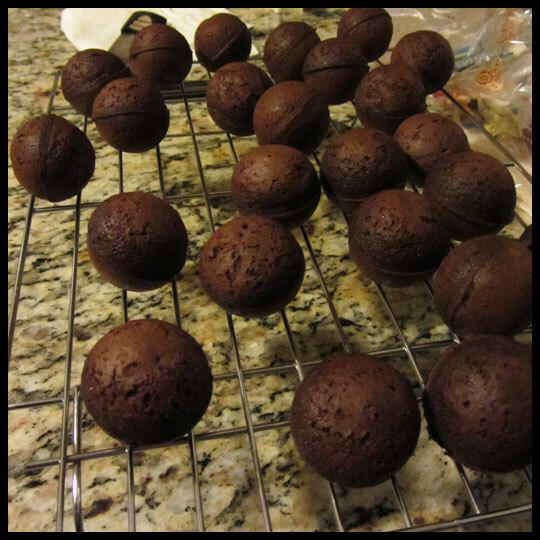 The cake mix was made and each batch of 12 was baked for 4 to 6 minutes creating perfect spheres of moist chocolatey deliciousness. It wasn’t until we got to the chocolate glaze mix (which is included in the overpriced box mix) that we thought, “Something is not right.” The first surprise was that the glaze was a powdered mix. I’ve seen and eaten a lot of cake pops in my time and I was pretty sure that most are made with a chocolate or candy coating, not something that starts from a powdered mix. But, we carried on like good little bakers, following all the directions and mixing every ingredient with care. 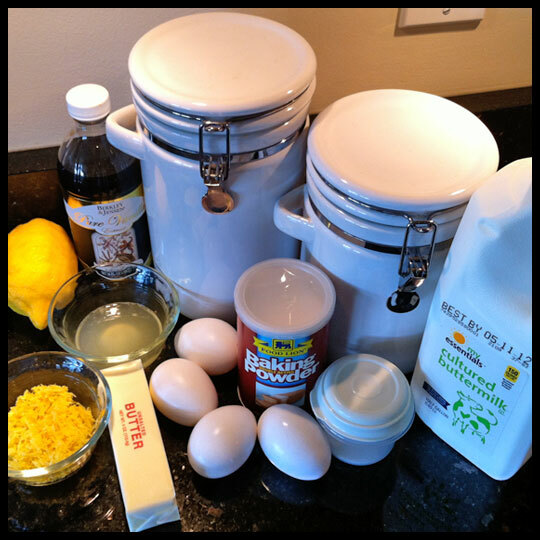 Once all the ingredients were incorporated, we both agreed that it looked… strange. It didn’t look appetizing at all, and when we tested the glaze all I tasted was confectioners sugar. There wasn’t a hint of chocolate in sight. Despite that, we decided to proceed, hoping that the flavor would work better once it was combined with the cake. This is where we ran into yet another problem. The glaze wouldn’t set up and we ended up with a dripping mess. So instead of cake pops, we decided they would be cake truffles. However, they didn’t look very appealing either. Instead of a smooth chocolate shell, it looked waxy and gross. I decided right then and there that there was absolutely no way I could or would sell them at the bake sale looking (and tasting) like this. 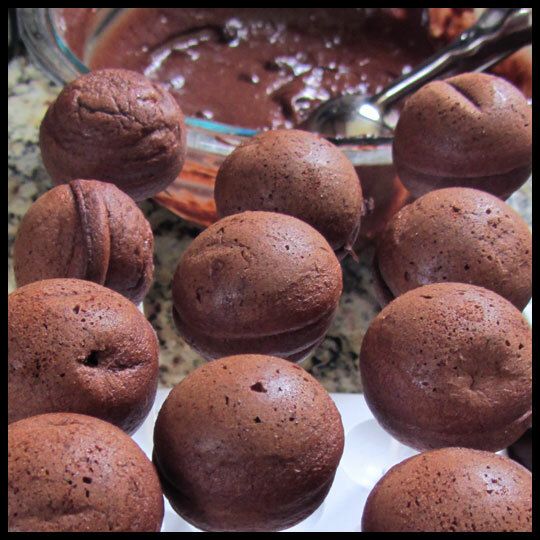 We had 16 un-dipped cake balls left and needed to figure out what we were going to do with them. After digging through my candy basket (any sweets lover should have a proper candy basket), I found enough chocolate bars to melt down to dip the remaining cake balls in. After a short debate on microwave versus rigging up a double boiler, we decided to go with the later. The microwave is a little risky and easy to over cook the chocolate, and since we were running on a limited supply, I didn’t want to take the chance. 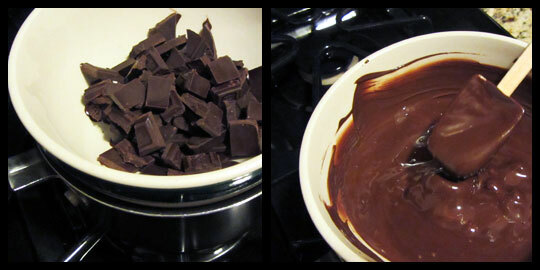 The double boiler was super easy and ended up being the perfect solution. Finally we were doing something right! 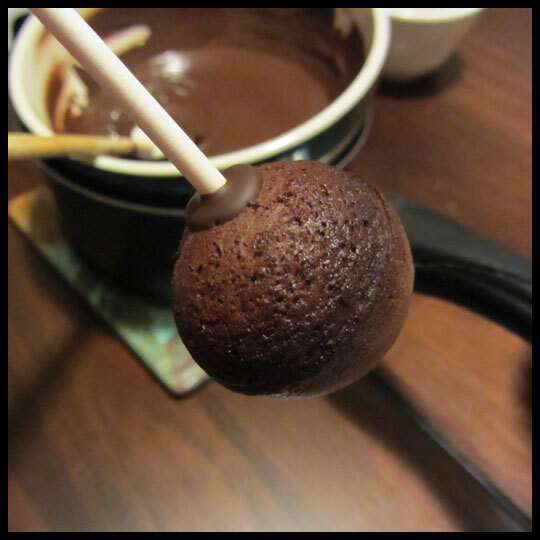 We also decided to dip the sticks in the chocolate, then insert them into the cake balls so that they stuck to the stick and didn’t spin around (like they did in the first round with the nasty glaze). 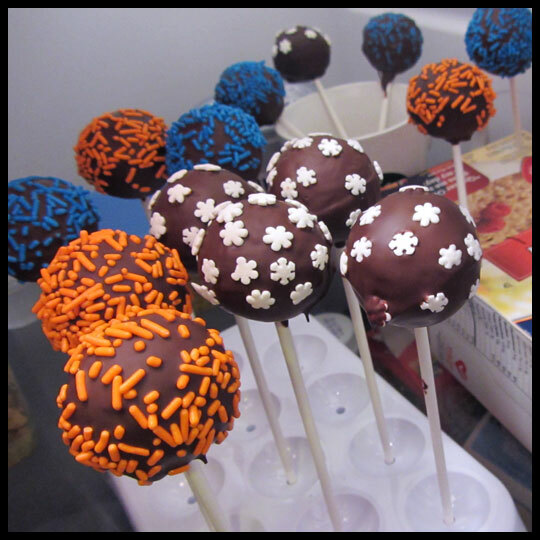 This worked like a charm and before we knew it we had 16 beautifully decorated cake pops chilling in the refrigerator. While we sat there with a glass of wine and waited for them to set up (we couldn’t have done all that hard work without sampling one before Kerry left), I thanked Kerry repeatedly for being there. If it hadn’t been for her I would have probably thrown all the cake pops against the wall in frustration, instead of laughing my way through all the ups and downs. The next morning I proudly texted a photo of our accomplishment to Crusaders Jenn and Elisa. They both responded with praise, until Jenn asked how many I had… After finding out I only had 15, she asked if I could possibly make about 10 more. I explained that in order to do so, I would probably have to take some of the batter from the cupcakes I planned to make later that day. After a little back and forth, we both agreed that I should do just that. 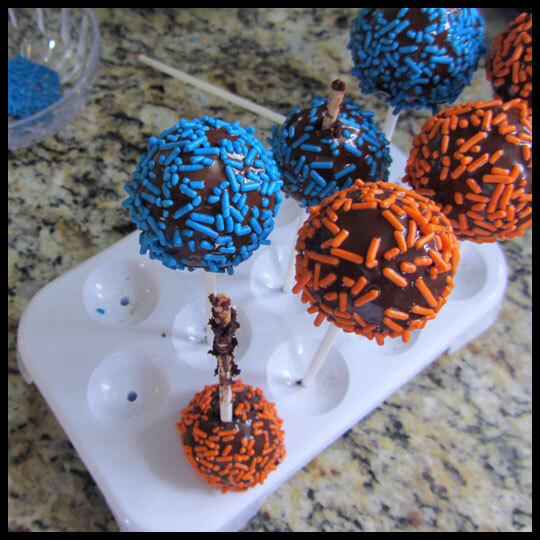 So I found myself making cake pops again. Misshapen, wrinkly, deflated looking cake balls. Just like the night before though, I didn’t let this stop me. I melted chocolate (which I had to purchase after depleting my supply the night before), stuck the sticks in, and let them set before dipping and decorating. My hope was that the chocolate and sprinkles would hide the imperfections of the cake balls, but I wasn’t prepared for what happened as I was decorating them. If you aren’t sure what you are looking at, let me describe it to you. Apparently the cake was too soft to hold up all the chocolate and sprinkles, so it plummeted to the bottom of the stick, poking a hole clear through the entire cake ball. At this point I was screaming nasty four letter words in my head without my friend by my side to help me laugh it all off. Luckily it only happened with 2 cake pops so I was left with 10 new ones. 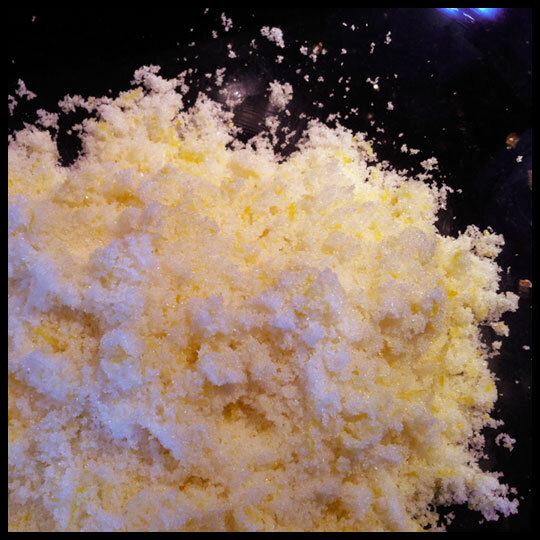 In the end I learned some valuable baking lessens: first, never use a glaze that comes in powdered form from a box. Second, I really need to figure out how to make a denser cake if I’m going to keep making these since I don’t want to spend $10 on a box mix. 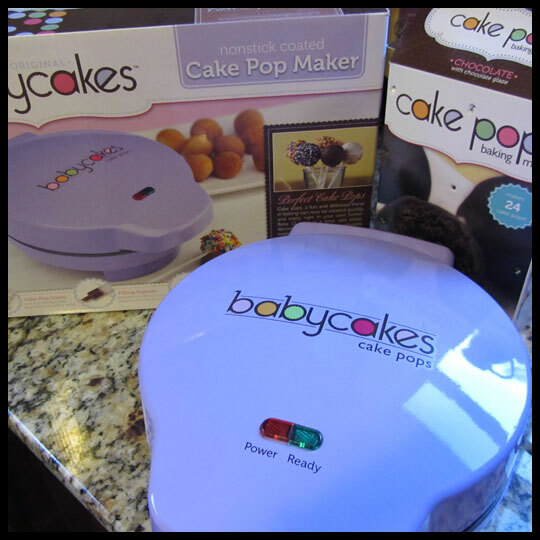 Last, the BabyCakes cake pop maker was the easiest part in the whole process and I will definitely be using it again. Even with all the problems that came up, I still produced 25 quality cake pops that brought smiles to many kids’ faces during the bake sale, I made some great memories with a good friend, and I helped raise money for a great cause, so it was all totally worth it. 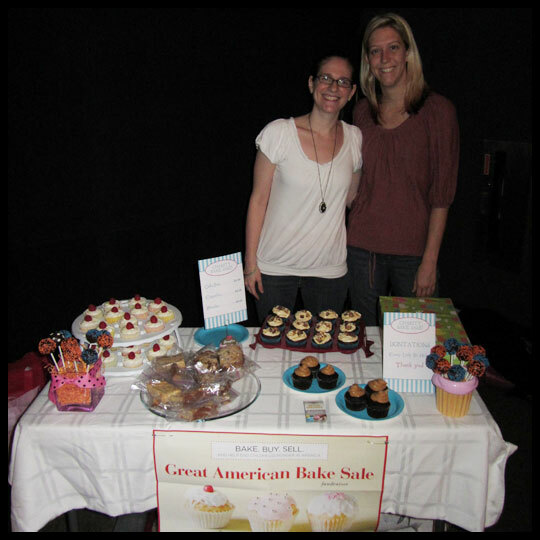 Yesterday, Crusaders Jenn, Elisa and I held our very first bake sale at Horizon Church in Owings Mills, MD. Our goal was to raise money for Share Our Strength’s Great American Bake Sale to support the No Kid Hungry Campaign, and thanks to the Horizon family, we did just that! It was amazing to see how happy all the sweet treats made everyone and to witness the generosity of those who donated without asking for anything in return. 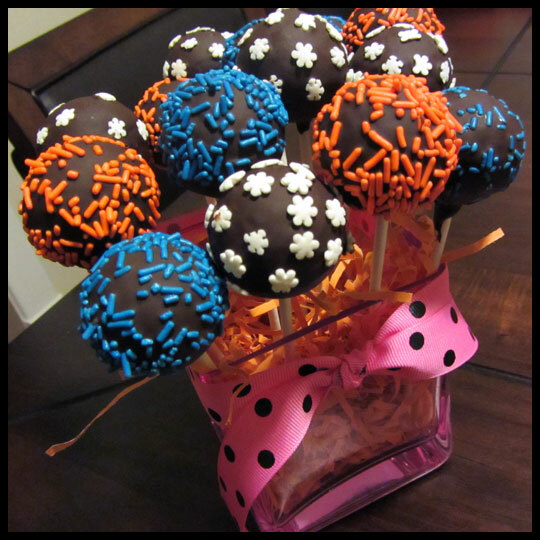 We started with 2 dozen Chocolate Chocolate cake pops (which the kids LOVED! ), 2 dozen Snickers cupcakes, 2 dozen Lemon Raspberry cupcakes, and 2 different kinds of blondies. By the end we couldn’t believe we had sold almost everything! Even though we did really well and raised about $140, we still haven’t reached our target of raising $300 dollars for this wonderful cause. If you aren’t familiar with the Great American Bake Sale and the No Kid Hungry campaign, you can read more here or see our interview with La Casa de Sweets, a charity baker that is committed to raising money and awareness for hungry kids in America. We are raising money until April 30th, so if you are interested, please consider donating! Even if you can only give $1, every little bit helps! 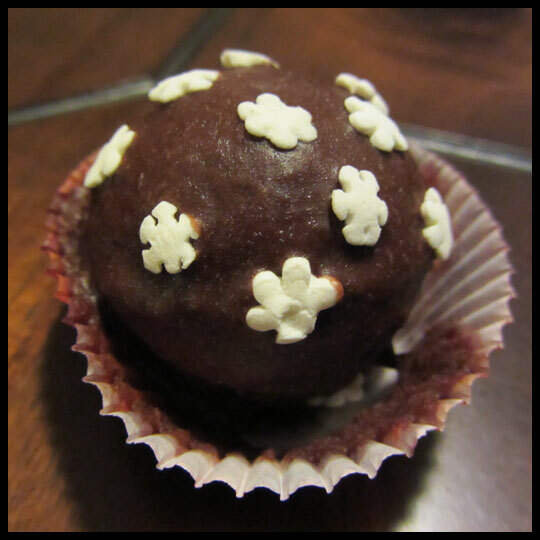 Throughout the week we will feature our recipe reviews for the Chocolate Chocolate cake pops, the Lemon Raspberry cupcakes, and the Snickers cupcakes. If you decide at any time that you would like to donate, you can find a link in the right column on our home page or at the bottom of all of our posts. Thanks again to everyone at Horizon Church, and thank you to all our readers for your support! As you may know by now, we have joined with La Casa de Sweets to raise money for Share Our Strength’s Great American Bake Sale to end childhood hunger in America. 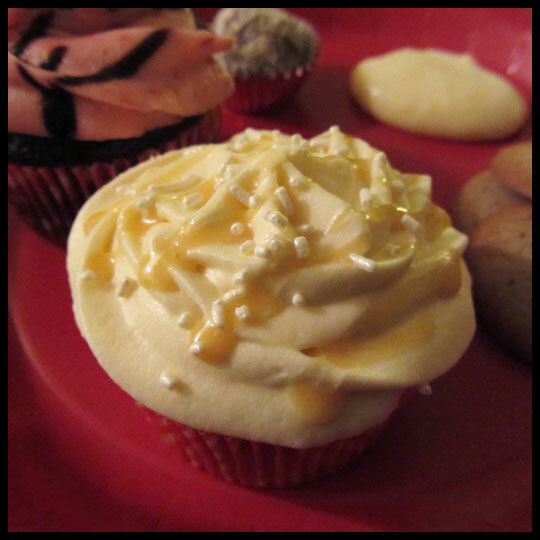 Jackie, from La Casa de Sweets, is a charity fundraiser baker which means that she bakes and blogs specifically to raise money and awareness to fight childhood hunger in America. This busy blogger (and mom of two) took some time out of her hectic schedule to answer some questions about herself, why ending childhood hunger is so important to her, and why you should join in this fun and important event. What made you decide to become a charity fundraiser baker? 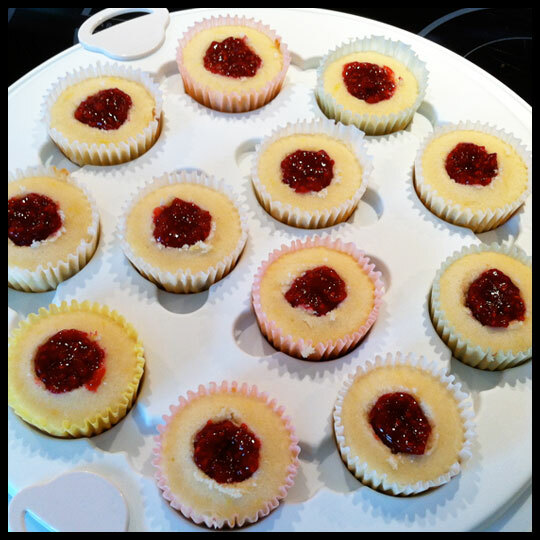 I decided to become a charity fundraiser baker to raise money for hungry children. As a teacher and mom I know one of the worst things you can witness is a child going hungry. My Masters course work focused on Child Health and Promotion around the world, so I have a pretty good understanding of what the problems are relating to hunger, and what needs to be done about it. I’ve always loved to bake, and when I decided to start my own baking business, I knew it had to be for a reason. So, I decided to help raise awareness and money to help end childhood hunger. Why should people donate or join the Great American Bake Sale? The Great American Bake Sale is such an awesome event! Bakers from across the country come together to raise money for the No Kid Hungry campaign, it’s just so inspiring! I feel so honored to a tiny part of such a huge event. Unfortunately not everyone knows that 1 in 4 children in this country face hunger every single day. That’s such a heart-wrenching number. But, the good news is, there is a solution. Raising awareness and supporting programs such as GABS will help people realize this is something we can fix. Every single donation counts. Every $5, $10, $100 donated will make a huge impact on the lives of kids around the country. If that’s not something worth doing, I’m not sure what is. Has any charity event been extra special or exceeded any goals or expectations you set for yourself? I’ve launched and advised several large fundraisers, and I’m always so happy after every one, because I’ve seen that people care. In a time where everyone’s circumstances are far from secure, I’ve seen people go out of their way to help, to raise money, to get the word out there. And that makes all the hard work worthwhile! Crusader Jenn, the mom in our group, wanted to know how you manage to find time to raise your family, maintain your blog, bake, and raise money and awareness to end childhood hunger all at the same time? How do I find the time? I’m not sure, really. I raise our two daughters (our oldest is almost 3 and our youngest is 16 months old), bake and sell for charity, organize fundraisers, work with companies and individuals to raise awareness, bake for my blog, make three all-natural vegetarian meals a day, go to church, and enjoy time with family friends, every single week. My prayers for strength are definitely being answered every single day! 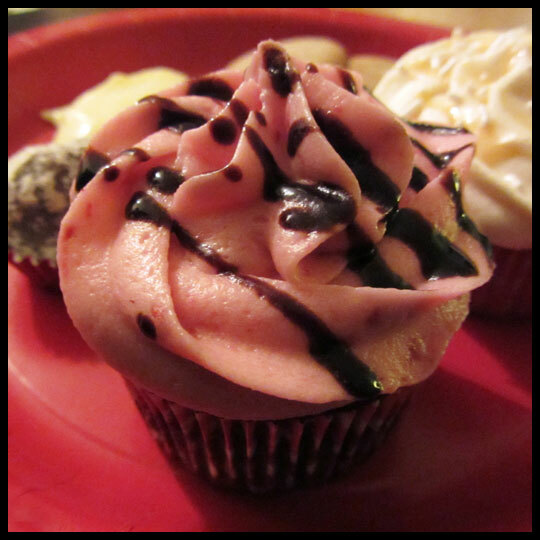 And of course we have to ask: what is your favorite place to get cupcakes and what is your favorite cupcake recipe? I love strawberry pretzel salad, mud pie, and you’ll never stop me from eating soft and chewy cookies!!!!! The Crusaders want to thank Jackie for taking the time to answer our questions! If you would like to donate to the Great American Bake Sale please click here. Remember, every little bit helps and no amount is too small! 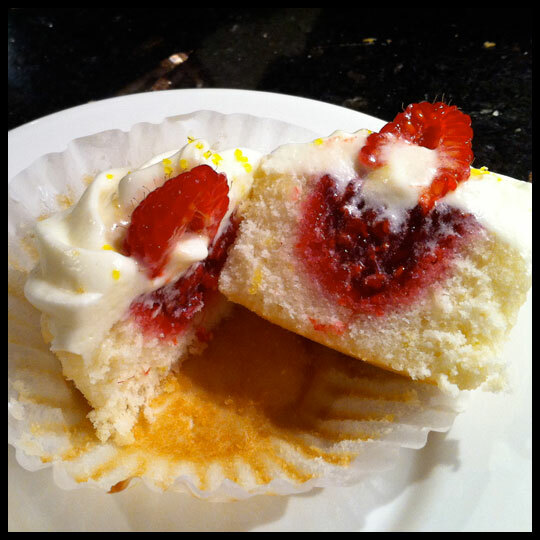 To visit La Casa de Sweets website and view her recipes click here. Thank you!